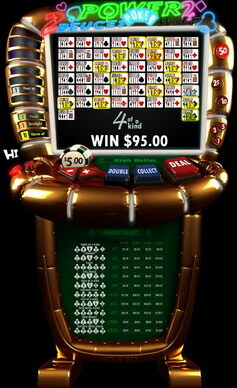 Win a Day Casino announces a new video poker poker machine – Deuces Wild. This new version allows players to play several video poker hands simultaneously. Players can now play 1, 3, 5, 10, 25 or even 50 hands at once and have the option to double their winnings at the end of the round. DEUCES WILD TOP SPINNER: Be the SECOND player with most TOTAL BETS during this promotional period and they will give you a bonus equaling 100% of the deposits you made during the promotion (August 14 through August 20). This means that all spins and wins are free! Please note that this offer is valid only for wagers made on the Deuces Wild slot machine. DEUCES WILD TRIPLE LUCK: Get the SECOND biggest single spin pay out during this promotional period and they will triple your winnings on that spin! You will not only be lucky but you will be lucky 3 times over! Again, this offer is valid only for wagers made on Deuces Wild. DEUCES WILD DRAW: Along with their classic promotions Top Spinner and Triple Luck Win a Day Casino has prepared an additional contest called Deuces Wild Draw. Everyone who plays at least 10 complete rounds with a minimal total bet of $1 from August 14th through August 20th will qualify for a drawing where 10 randomly chosen players will receive a $100 bonus. Their accounts will be credited on Tuesday, August 25, 2009. This special offer is valid only from Friday, August 14, 2009, from 12:01 AM until Thursday, August 20, 2009, 11:59 AM EST. (Friday, August 14, 2009, 05:01 GMT until Friday, August 21, 2009, 04:59 GMT) Visit Win a Day Casino now and try out Deuces Wild for yourself. This entry was posted on Friday, August 14th, 2009 at 5:10 pm	and is filed under Casino Promotions. You can follow any responses to this entry through the RSS 2.0 feed. Both comments and pings are currently closed.